Today at Microsoft Global Exchange Conference (MGX), Microsoft has officially announced that Windows 7 and Windows Server 2008 R2 are complete and are now ready for Release to Manufacturing (RTM) to the OEM’s & other Partners. OEM’s and Microsoft Partners will get the final bits in just under two days, which means that the debate over whether or not Windows 7 Build 7600.16385.090713-1255 is indeed the RTM build will be confirmed by this coming Friday. Connect, MSDN and TechNet subscribers will get it on 6th August, General availability on October 22nd. Both x86 and x64 Builds of Windows 7 RTM Build 7600.16385.090713-1255 can be downloaded from here. Congratulation to Windows 7 development team which was lead by Steven Sinofsky – President, Windows Division for completing one of the finest Windows releases ever. 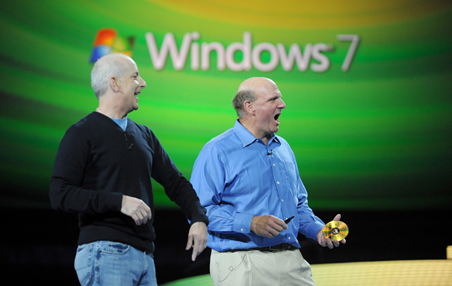 Steven Sinofsky & Steve Ballmer holding gold RTM disc at MGX. UPDATE 1: It is now confirmed that Windows 7 Build 7600.16385.090713-1255 is indeed the final RTM. Download it from here. UPDATE 2: Original Windows 7 RTM Build 7600.16385.090713-1255 (x86 and x64) ISO is now available. Get it from here. Hence. You were right Taimur Bhai. But can MS change something during these days and upload a new build as RTM?? ?